Shipping Information - $7.00 US Priority Shipping! Exchanges & Returns - 30 Day Return Policy! On US Orders of $50 or more! - Arabesque pattern. Black and metallic gold. 2" wide. 8 + 8 yards available. 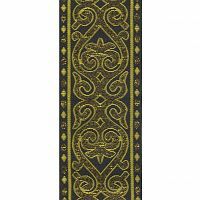 Find the trim you love first, and then look for a fabric to match. 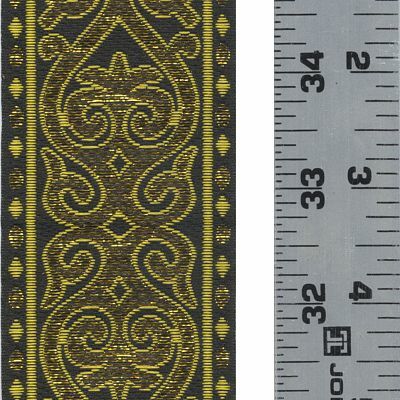 Trims can be hard to find, with limited selection. Especially if you are shopping at local stores, you will usually have an easier time finding fabrics to match. Snip off several inches of each trim you own, and keep it in a ziplock baggie. Carry it with you always! Trust me, you'll want to have it on hand when you find a new fabric store, or stumble across a garage sale with craft supplies. Wash your trim before you use it. You don't want any unexpected shrinkage or fading once you've put a lot of hard work into your project. Use a lingerie bag to keep it from tangling in the wash. Always buy more that you think you need. You can always use the extra to put another band around the sleeve, or decorate a pouch. But you really, really don't want to find out you're 10" short of what you need when you are halfway through your project. The narrower the trim, the easier it is to sew around curves. Necklines can be especially tricky. Hemlines may look like they are cut straight across, but they often have a bit of curve to them too. Really wide trims do best on sleeves, or "clavi" (over the shoulders), or the openings of cloaks, where you can let it lie perfectly flat. Where can I find similar items? 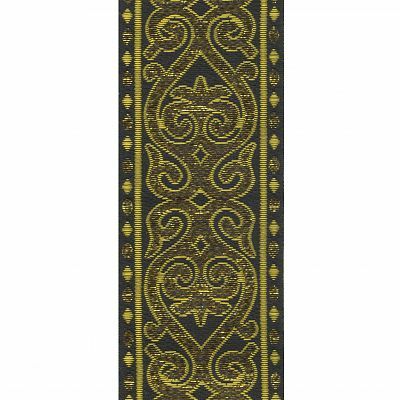 Do you have any other questions about our Black and Metallic Gold Arabesque Trim? We'll get back to you with the info you need. Click here to ask your question. Name: Please enter your name. This is used to block spam. Please check if you are a human. Do you own this item? How do you rate it? Name to display with review Please enter a name to display with the review. Please note: We do not have a store front or showroom. We sell only via website mail order and at special events. The Gryphon and Moon Logo and the contents of this site © 1995-2019 by Gryphon's Moon, All Rights Reserved.